Right in the centre of St. Moritz, overlooking the nearby lake, lies Kulm Hotel St. Moritz. Within its noble walls awaits an incomparable aura that is founded on 150 years of traditional hospitality. The renowned Kulm Hotel St. Moritz is not just another luxury hotel. It opened its doors for the first time in 1856 and its founder, Johannes Badrutt, initiated a tradition that remains very much alive till today. The mission of Kulm Hotel St. Moritz was to provide each of its guests, young or old, with a cherished and unforgettable memory. It is characterized not only by style, but also by originality. It was here at Kulm Hotel where the first electric arc light in Switzerland was lit and here in St. Moritz where in 1928 and 1948 the Winter Olympic Games were officially opened. In this hotel the original deco is very well preserved and so it the state-of-the-art infrastructure. The distinguishing mark of the decorative art of the building is its combination of late 19th century elegance and local, Engadine elements. Kulm Hotel St. Moritz is definitely a family hotel. All children are welcomed and a varied, quality program will make a stay at pleasant and enjoyable for the entire family. Most of the hotel’s rooms can be linked to each other via a communicating door, which makes them particularly suitable for relaxed family holidays. 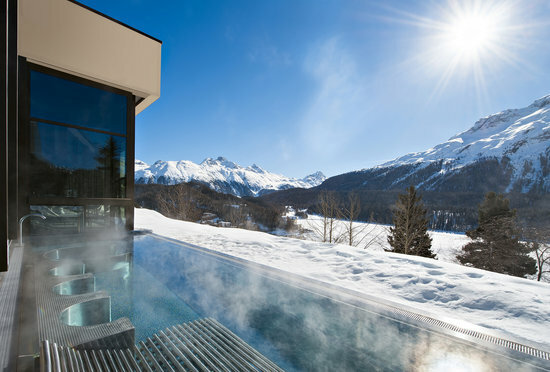 Kulm Hotel St. Moritz is not only for winter vacations. It offers an amazing alpine sports and adventure program. The summer programs are exclusively addressed to adults and children aged 12 and up. The program is designed so as to give guests the opportunity to discover exciting adventures with the hotel’s experienced guides. So, they become familiar with the Alpine world and get a close-up look from the experts. As a luxury hotel, Kulm Hotel St. Moritz has various dining spots, which guests can choose from. The Grand restaurant, presenting a discreet elegance, offers to guests a true gastronomic experience. A 6-course menu is available as a half board evening meal, plus a delicious selection of exclusive à la carte dishes. A more casual choice would be The Pizzeria. A typical Italian trattoria specializing in refined pasta dishes, pizza, as well as meat and fish selections that are sure to please the most discerning diners. The delicious wood-oven baked pizzas are also particularly popular. Another recommended place to eat, would be Chesa al Parc, located at the entrance of Kulm Park. Its beautiful sun terrace combines sporting elegance with the rustic charm of a cozy Engadine-style restaurant. It is the perfect place to dream or meet friends. Snacks, daily menus, coffee and delicious homemade cakes are available throughout the day. In the evening, the guests can taste various Swiss specialties and international cuisine among gourmet enthusiasts and connoisseurs. Make sure to visit Sunny Bar in the evening to enjoy the Jazz happenings on Fridays and Saturdays, where guest pianist and singers are performing! The hotel is everything you would expect of a 5-star Hotel, with its efficient and friendly staff attending to every need of yours. Kulm Hotel St. Moritz is a place you would certainly consider revisiting! Badrutt Palace -Top of the world! Badrutt’s Palace Hotel, situated amidst breathtaking and unspoiled scenery, has long been hailed as a landmark in the centre of St.Moritz and is the ultimate expression of the Swiss Alps region. A favorite of celebrities and royalty alike since its opening in 1896, Badrutt’s Palace Hotel offers 157 guestrooms including 38 suites with stunning views of the Swiss Alps. Badrutt’s Palace Hotel is a celebration of style, sports, cuisine and fashion, with discreet service and traditional elegance evoking an atmosphere of pampered luxury for all. An ideal destination in both winter and summer, as the hotel is located in one of the most challenging, ski areas in the world and offers a large variety of summer activities. Guests find the ultimate in relaxation in the Palace Wellness, exciting nightlife at the King’s Club, and world-renown cuisine in the hotel’s restaurant –including Nobu-and nearby Chesa Veglia. Amid the crystal lakes and majestic peaks of the Swiss Alps a unique place has been created which unites specialized wellness facilities and treatments in conjuction with the nature and beauty of the Engadin valley.”Palace Welness” is a refuge designed to follow the excellence , tradition and history of the Badrutt’s Palace Hotel. St Moritz is regarded as the birthplace of winter tourism in the Alps: sophisticated travellers have been visiting St. Moritz since the middle of the 19th century, even in the coldest season of the year. Johannes Badrutt was the pioneering host who enticed the first holidaymakers to the magical snowscape of the Upper Engadin. Even 115 years after the opening of Badrutt’s Palace Hotel, this luxury hotel still represents superiority in its offer and service!